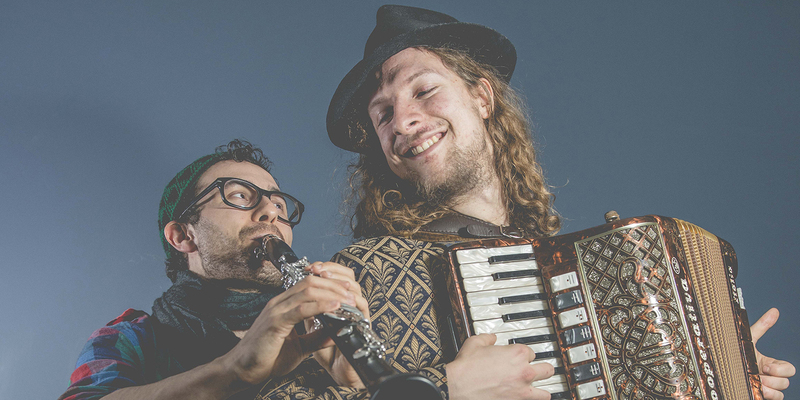 Josh Middleton is an accordionist who joined multi-award winning Don Kipper in 2013. Summarise a Don Kipper performance in three words. What or who got you interested in Jewish and Roma music-making? Each member of the band has their own journey into these styles of music, mine was through the accordion. There’s virtuosity, combined with emotion and subtlety in both these styles. I have a degree in ethnomusicology but my ‘training’ is mostly on the job! I’ve been gigging for puppet shows with my family’s business Puppet Theatre Barge since I was 12. Who’s the most inspiring person you’ve performed with? Probably Frank London, his energy is infectious and his ability to get the best out of each member of his ensemble is inspiring. He was a real privilege to play with. Do you have any specialist skills that you work into your repertoire during performances to keep energy in the room? I guess I add my own style of performance which stems from the theatre world I grew up in. Basically, never play with your eyes on your feet, always play out to the audience. Playing at the BBC3 stage at the World of Music Arts and Dance Festival (WOMAD) to over 1000 people – it was amazing! I was once playing in a band (not to be named) and the singer started in the wrong key. He then proceeded to yell at the sound guy and storm off stage, leaving the rest of us standing there. That was the end of the gig. One piece of advice you wish someone had told you as a student? Want to see Josh perform? CLICK HERE to get your tickets for tonight’s performance.